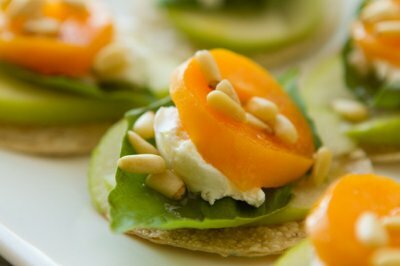 Stacks of fresh apricot, apple and goat cheese for quick and easy prep. Preheat the oven to 350F. Line a baking sheet with parchment paper. Set aside. Press a 3-inch circular cookie cutter into the gluten-free tortilla. Repeat to create 8 total rounds. Place on prepared baking sheet and bake for 4-5 minutes. Cover apple slices in lemon juice and combine honey and oil in a small dish. Line cooled tortilla rounds on a large plate. 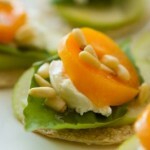 Stack with 2 slices of apple, 1 basil leaf and a small dollop of cream cheese. Top with apricot, a drop of honey mixture, and a sprinkle of pine nuts.